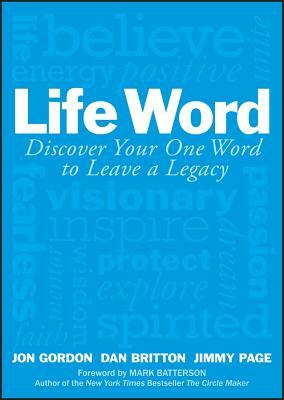 Life Word reveals a simple, powerful tool to help you identify the word that will inspire you to live your best life while leaving your greatest legacy. In the process you'll discover your why which will help show you the way to live with a renewed sense of power, purpose and passion. JON GORDON is the author of The Wall Street Journal bestseller The Energy Bus, The No Complaining Rule, Training Camp, The Carpenter, Soup, The Seed, and The Positive Dog. Jon and his tips have been featured on Today, CNN, Fox & Friends, and in numerous magazines and newspapers. Follow him on Twitter @JonGordon11. DAN BRITTON is a speaker, author, coach, marathon runner, and former professional lacrosse player who serves as the Executive Vice President of International Ministry for the Fellowship of Christian Athletes. Dan has coauthored five books, WisdomWalks, True Competitor, One Word That Will Change Your Life, Called to Greatness, Life Word, and is the author/editor of twelve FCA books. Follow him on Twitter @fcadan. JIMMY PAGE serves as a Vice President of Field Ministry for the Fellowship of Christian Athletes. Jimmy is a speaker, author, leadership coach, NIKE sports performance coach, and Spartan racer. He has coauthored several books including One Word That Will Change Your Life, WisdomWalks, True Competitor, and Called to Greatness. He hosts a weekly radio segment called FitFridays. Follow him on Twitter @JimmyPageVT.